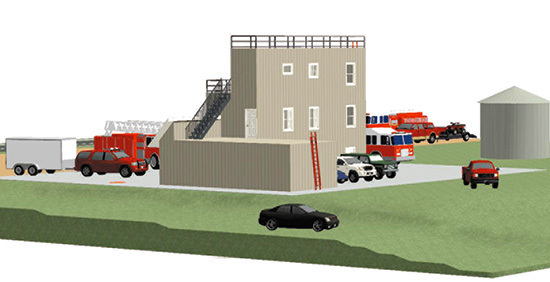 The Decorah Volunteer Fire Department and Toppling Goliath are holding a semi-formal gala Friday, Feb. 8, to raise awareness and funds for the Decorah Fire Department’s planned new state-of-the art training facility, pictured above. The role of the volunteer members of the Decorah Fire Department has been changing in recent years, according to Chief Mike Ashbacher. “It’s not just fires any more,” he said. Firefighters are called to a variety of rescue situations and to meet the changing demands of the job, volunteers need a place to train. The Department is planning to build a new training facility that will be made available to all the fire departments within the county on county property just south of the Freeport county shop. The Decorah Volunteer Fire Department and Toppling Goliath are holding a semi-formal gala Friday, Feb. 8, to raise awareness and funds for the new state-of-the art training facility. A committee of firefighters has been exploring the idea of a training facility for an extensive period of time, Ashbacher said. “The whole thought behind the training center is to have an all-encompassing type of facility to be able to train on multiple aspects of what the fire department encounters,” he said. The project is expected to cost about $100,000 and Ashbacher is hoping it will be paid for through donated funds. The Depot Outlet in Decorah recently donated $50,000 for the project. “This money the Depot donated to us will hopefully allow us to build upon some of the areas of training that we hope to accomplish in the facility,” he said. “The donation from the Depot is very important. Without that donation, it would have taken us longer to accomplish our goal for the funds we’re trying to raise. “We know it’s going to be an expensive endeavor. That’s why we’ve taken our time and thought out the layout of the facility,” Ashbacher said. Department fundraisers have paid for technical rope rescue equipment, the department drone, an inflatable raft and water rescue equipment. “This (training facility) is just a little bigger scale of what we have done in the past. We felt this is a very important part of what we do. Training is the foundation of the department. We’re always looking for different types of training. We just think having a training facility we can use at any time and set up for any type of training scenario will be beneficial,” Ashbacher said. Firefighters have toured other training facilities to determine what would be the best fit for the Decorah Fire Department. “We’re trying to do it as economically as we can. We’re hoping to do the majority of the work ourselves to save more money,” he said. The chief said it also would be a team building experience for firefighters who work on the project. “There’s a lot of excitement among the members here to get this project up and running,” he said. The training facility will be built out of steel shipping containers and will be three stories high. “We’ll be able to burn on all three levels of the building,” Ashbacher said. It will be a place where firefighters can train for a variety of emergency situations, in addition to focusing on agricultural and rural calls such as grain-bin rescues, trench rescue, tractor/farm and vehicle extrication and rope rescues. Work is expected to start this spring with completion this fall when the Department will schedule an open house at the training facility. The Fire Department will offer public education classes there on topics such as the importance of closing a door in the event of a fire, Christmas tree fires, turkey fryer fires and fire extinguisher training. Ashbacher said the department is fortunate to have the support of the community. “Without it, we wouldn’t be able to do a project like this,” he said. He said he also appreciates the Winneshiek County Board of Supervisors working with the department on the location on county property. Ashbacher said the department responded to 205 calls for service in 2018 – the most for a year in his 28 years with the department. The department is keeping busy in 2019, Ashbacher said, with calls already ahead of last year at this time. The calls and firefighters’ training equal a lot of personnel hours logged by the volunteers, he said. Firefighters train three Wednesdays each month. “We’re very fortunate to have the volunteers that commit the time that they do. Across the country, volunteer departments are having a hard time recruiting volunteers and their numbers are down,” Ashbacher said. The Decorah department is now four members short, Ashbacher said. Anyone interested in volunteering should stop by the fire station and talk to the engineer on duty to find out more about the department. The Feb. 8 gala begins at 7 p.m. and features cold brews, an all-night hors d’oeuvres buffet, raffles, silent auction items, brewery tours and an opportunity to mingle with local fire department volunteers. Items will be raffled every half hour throughout the three-hour event. Ashbacher also will present plans for the new facility. The Decorah Volunteer Firefighters Association recently established two new funds with the Winneshiek County Community Foundation. The Decorah Volunteer Firefighters Association Endowment Fund and Decorah Volunteer Firefighters Quasi Endowment Fund both support the activities of the Decorah Fire Department. Gifts can be mailed to the CFNEIA administrative office at 3117 Greenhill Circle, Cedar Falls, IA, 50613. Checks should be made payable to the Decorah Volunteer Firefighters Association Endowment Fund or Decorah Volunteer Firefighters Association Quasi Endowment Fund. Gifts can also be made on the Community Foundation’s secure website at cfneia.org/give. Donations also can be made out to the Decorah Volunteer Fire Department and mailed to 400 Claiborne Drive, Decorah IA, 52101.